Cold Stone Creamery whips up a trio of cake batter ice cream flavors this summer in celebration of their 30th anniversary. - The Big 3-0 - Cake Batter ice cream with 30th anniversary sprinkles, brownie, and fudge. - Berry Me in Batter - Strawberry Cake Batter ice cream with strawberry wafers, caramel, and whipped topping. - The More Chocolate The Batter - Chocolate Cake Batter Ganache ice cream with brownie, fudge, caramel, and whipped topping. 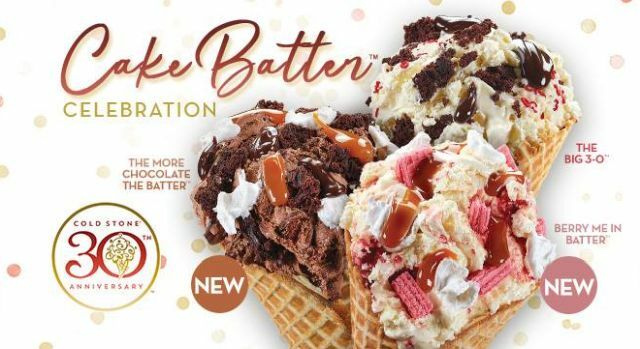 The three flavors and their corresponding Creations can be found at Cold Stone Creamery through August 28, 2018. - Oreo Cookies & Cream Extreme - Layers of yellow cake, Cake Batter ice cream with Oreo cookies and chocolate ice cream with Golden Oreo cookies wrapped in fluffy Oreo cookie frosting. - Tall, Dark & Delicious - Layers of devil's food cake, sweet cream ice cream with brownies and chocolate ice cream with Oreo cookies wrapped in white frosting and fudge ganache.